The Isotope Hydrology Laboratory (IHL) of the Water Resources Programme, located at the Vienna International Centre provides isotopic analytical services to the IAEA and its water resource development programmes and expert technical advice to member states to help ensure the quality of isotope hydrology measurements conducted in laboratories around the globe. Since 1995, over 50 countries have benefited from IAEA supported acquisition of new or upgraded isotope hydrology analytical facilities. To promote the adoption of isotopic methods into water resource assessments, the IHL also provides technical advice and hands-on training to Member States. Accordingly, the IHL conducts global laboratory proficiency testing for stable isotope and tritium assays, and provides participating laboratories with test samples and software to help improve their analytical performance. The laboratory provides global leadership through testing of new technological isotopic measurement advances in the areas of laser absorption spectroscopy, isotope-ratio mass-spectrometry, radio-isotopes, the noble gases and their rare isotopes. The IHL also provides analytical support to the Water Resource Programme's global hydrology monitoring networks, including the Global Network of Isotopes in Precipitation (GNIP), and the Global Network of Isotopes in Rivers (GNIR). Isotopic data produced by the IHL are contributed to the GNIP and GNIR databases, data which is made available cost-free to Member States via the internet. The IHL supports Technical Cooperation (TC) projects by facilitating isotopic analytical services for δ2H, δ18O, δ13C, noble gases, tritium, and CFCs. The Isotope Hydrology Laboratory (IHL) houses state-of-the-art analytical equipment for the collection and measurement of stable and radiogenic isotopes and noble gases from water and hydrological samples for global programmes (GNIP/GNIR),for use in coordinated research projects (CRPs), ground water age dating, and for the purposes of global isotope laboratory proficiency testing. The Isotope Hydrology Laboratory (IHL) houses two large sector static mass spectrometers for precise determination of noble gas isotope abundances dissolved in groundwater. The systems are optimized for accepting gas samples collected by passive diffusion samplers and portable membrane contactor samplers, or using a gas extraction system for water samples collected by copper tube samplers. The mass spectrometers are integrated with ultra-high vacuum gas purification systems and cryogenic traps that separate each noble gas for mass spectroscopic analysis by a sector mass spectrometer for helium isotopes and by quadrupole mass spectrometers for heavier noble gases. Operation and data acquisition of entire system is fully automated for maximum sample throughput. Laser absorption spectroscopy (LAS) is a newly developed technology that offers a low cost, high-precision, method for the measurement of δ2H and δ18O in ground and surface water samples using optical methods. The IHL currently houses Off-Axis and Cavity Ring Down laser spectrographs for routine water isotope analyses, and operates a dedicated laser lab for instructional training courses for staff in Member State laboratories. Ultra-high precision stable isotope-ratio mass spectrometry (IRMS) is used for many decades for the measurement of stable isotopes in water and its dissolved constituents, like δ2H and δ18O in water and δ13C in dissolved inorganic carbon. The IHL currently houses a dual-inlet IRMS system with a CO2-H2O and H2-H2O equilibration device for the automated H and O isotope analyses of liquid water samples. Radioactive tritium and its decay product 3He is used to precisely age date ground water resources over a 60-year time period. 81Kr is used to date very old fossil groundwater to at millennium timeframes. The IHL houses analytical facilities for conventional and enriched tritium analyses and for 3He by mass spectrometry, radon-222, and has developed new custom field collection devices for the extraction and collection of Kr and other radiogenic gases from groundwater for external isotopic assays. The IHL houses a CFC (chlorofluorocarbon) gas-chromatograph system for measuring CFCs as tracers in hydrological investigations and age dating of recent ground water. Additionally, the IHL has field portable 222Rn instrument used to quantify surface and ground water interactions. The IHL has partnered with the U.S. Geological Survey to develop a Laboratory Information Management System (LIMS) system for water oxygen and hydrogen isotopes analyses for users of laser absorption spectrographs. LIMS for Lasers is a user-friendly data management system for all off-axis (OA-ICOS) or cavity ring-down (CRDS) laser absorption spectrographs (LAS) used for δ2H and δ18O assays of water. This software enables new and current users of LAS instruments to improve their laboratory productivity and QA/QC outcomes, and is available cost-free to all laboratories. The IHL houses a dedicated water-isotope laser spectroscopy student training facility. Incorporating diverse laser spectrographs and a computer lab, the facility offers week-long courses on the principles, operation, maintenance, and data management of laser absorption spectrographs (LAS) used for δ2H and δ18O assays of water, for up to 10 students from Member States. Currently courses are being offered in the spring and fall via the Technical Cooperation (TC) program. New laser spectroscopy laboratories frequently have difficulty obtaining appropriately scaled laboratory measurement standards for the daily routine normalization of δ2H and δ18O data from water samples. The IHL assists member state laser laboratories through provision of a supply of ready-to-use pre-calibrated daily-use secondary standards, and provides training in the development of local laboratory standards and the calibration to IAEA's primary reference materials. The IHL has a large-volume (600L) isothermal air-water equilibration system for production of copper sample tubes containing precise fixed amounts of noble gases dissolved in water. These samples can be used as matrix-equivalent laboratory standards for groundwater analyses by noble gas mass spectrometry. Owing to the size, stability and flexibility of temperature, the IHL can produce a large number of noble gas laboratory water standards for internal and use in Member States. As a part of the current tritium intercomparison (TRIC2012), the IHL created a large stock of the six samples containing known amounts of tritium. These samples can be used as quality control laboratory standards, and are available for distribution to assist developing and established tritium laboratories worldwide. The IHL conducts R&D on new sampling devices and technologies for noble and radiogenic isotopes. One recently completed device is a gas sampling device that enables the time-efficient field sampling of dissolved gases at the well-head in a field portable design. The device separates dissolved gases from water using membrane contactors and collects them in a small copper tube for analysis by mass spectrometry. The IHL further improved a field sampler for extracting gases from large volumes of water for analysis of radioactive krypton isotopes (81Kr and 85Kr) for groundwater dating purposes. This device compresses the extracted gases into a 12 L liter cylinder in about 1 hour. The international primary water isotope reference materials VSMOW2 and VSLAP2, as well as other stable isotope reference materials are currently offered for sale to member states through the IAEA Reference Products commercial web portal (http://nucleus.iaea.org/rpst/). 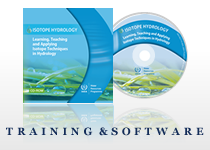 The Isotope Hydrology Laboratory organises proficiency testing for Member State laboratories engaged in the analyses of stable and radioactive isotopes commonly used in hydrology. These multi-year exercises are a core part of IAEA's goals to promote quality assurance and improve the reliability and comparability of isotope measurements. The IHL recently completed the 2012 Water Isotope Intercomparision (WICO) proficiency test. The WICO tests are conducted approximately every four years and are used to test the performance of laboratories around the world that conduct measurements of δ2H and δ18O in liquid water samples. The 2012 international Tritium Intercomparison (TRIC) for the global performance assessment of tritium (3H) assays made on water at environmental concentration levels is currently underway. TRIC tests are conducted every 4-5 years by the IHL. Samples are supplied with the tritium levels found in nature at the time of the test. Furthermore, the TRIC2012 includes special efforts to include conventional decay counting and the newer mass-spectrometry-3He accumulation methods.